Hangzhou is one of the most popular tourist destinations in China. This page will focus on How to Travel from Beijing to Hangzhou. The following are what you should do if you want to travel from Beijing to Hangzhou. Step 1: Book a flight ticket or train ticket from Beijing to Hangzhou. 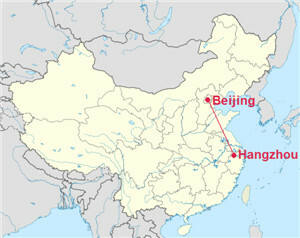 Hangzhou is about 1300km away from Beijing. You can go to Hangzhou by train or by air. There are also normal fast trains travelling from Beijing Railway Station to Hangzhou Railway Station.Prices range from 189.5CNY. By subway: Subway Line 4 and Line 14 to Beijing South Subway Station, get off the exit and then walk to the Railway Station. By Bus: No.20, 53, 63, 102, 106, 122, 203, 208, 377, 381, 454, 458, 485, 692, 741, 927, 939, 943, 958, 986, Te 3, Te 5, Yuntong 102 to Beijing South Railway Station. By taxi: The cost from midtown Beijing to Beijing South Railway Station is normally around RMB30 depending on the type of taxi. Hangzhou Railway Station is very close to the West Lake, only 1 or 2 km away. Subway and public buses are available if you want to visit West Lake or other places in Hangzhou. Step 2: Book a hotel in Hangzhou. Step 3: Take a tour in Hangzhou. Hangzhou is famous for its beautiful scenery of West Lake and the surrounding areas. It will take you 1 or 2 days to cover the attractions in Hangzhou. The nearby Shanghai, Suzhou are also famous tourist destinations. You can visit these cities together. We ChinaTour.Net offers tour service in Hangzhou. Contact us to customize your tour in Hangzhou.